A prisoner will be executed in couple of hours in Iran because of his religious believes. Human Rights Activists News Agency in Iran, announced via a statement that the Concise Prisoner “Mohsen Amir Aslani Zanjani” who has been jailed since April 2006 on the charges of “Corruption on earth, Heresy in Islam, Insulting the Prophet Jonah and Committing unlawful act”. This prisoner is on the death row at Rajaee Shahr Prison and his execution will take place while Iran’s media channels adopted silence and under Human Rights Activists’ lack of information. A close relative of this death row prisoner has told HRANA reporter: “Mohsen was arrested back in 2006 by security forces. He was a religious person who was active in the same domain and he used to manage and arrange Quran classes for interested citizens”. This source also mentioned that: “Mohsen was charged with “Heresy in Islam and claiming the connection with Imam Mahdi, Insulting the Prophet Jonah and committing unlawful act” after he was arrested by security forces. His case was prosecuted initially on the charges of “Heresy in Islam” and sentenced to 4 years and 10 months imprisonment. However, his case was put on trial again after he received a new indictment and accused of the previous and further charges. His trial took place at branch 15, Islamic Revolutionary Court by Judge Salavati in 2007 and he was sentenced to death. This verdict reversed 3 times at the Supreme Court. Whilst the case was going back and forth between Branch 15 at Islamic Revolutionary Court and Branch 31 at Supreme Court the Death Sentence reinstated with the recommendation by Chief Justice – the head of Iran’s Judiciary System- and using the Article 18. 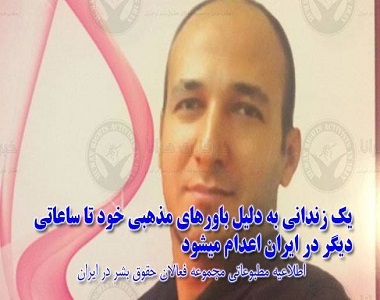 Today, Aslani Family has received the permission to visit their son at Karaj Rajaee Shahr Prison as the “final Visit”. Prison authorities have informed the family that the execution will take place at 5:00 am on Wednesday, 24 September, 2014 and his corps will be handed to his family in a cemetery in Karaj. Human Rights Activists News Agency in Iran trusts that security forces asks desperate families and prisoners to remain silent under the difficult situation either by threatening them or by giving them empty promises which this silence clearly will bring no good to the prisoner and their families. HRANA has remained silent about “Mohsen Amir Aslani” until now as it was asked by Mohsen’s family to remain silent. The family was promised that the verdict will be reversed if they remain quiet about the issue; hence they made no attempt to contact Media or Human Right organisations. It is important to note that many citizens are jailed or on the death row in Iran because of their religious believes. 34 Sunni death row prisoners, 3 Iranian Priests accused of “Corruption on earth” who their lives might be in danger, Soheil Arabi’s Death Sentence which he received on the charge of “Insulting the Profit” and also Mohsen Amir Aslani’s death Sentence because of his believes are examples that proves Iranian Regime put citizens lives in danger based on their believes. This is against the “Freedom of Expression and Speech” right and violates Iranian Regime commitments to “Freedom of Religion” right.